Get your base tan for summer! With summer just around the corner in Seattle, this is a great time of the year to start thinking about sun protection. Everyone knows that you should go to the tanning parlor and get a good base tan before you go on vacation to someplace sunny, because then you won’t get burned on vacation. And everyone knows that it’s OK to tan as much as you want, even every day, just as long as you don’t get burned. And of course, tanning is by far the most effective way to get Vitamin D. With all of this good news about tanning, Miller Family Dermatology has expanded its services and now has a full array of coin operated tanning beds where you or your teenage daughter can come tan as often as you’d like, delivering as much healthy ultraviolet radiation as you’d like to your skin with the expert supervision of the 10th grader we just hired to run it. We’ll supply all the baby oil you need and we wipe the machines down once every month to make sure you don’t get viral infections like herpes or warts. Pretty much all of that is completely made up or bogus, except for the parts that are sort of true or downright dangerous. Our “tans” are totally fake. 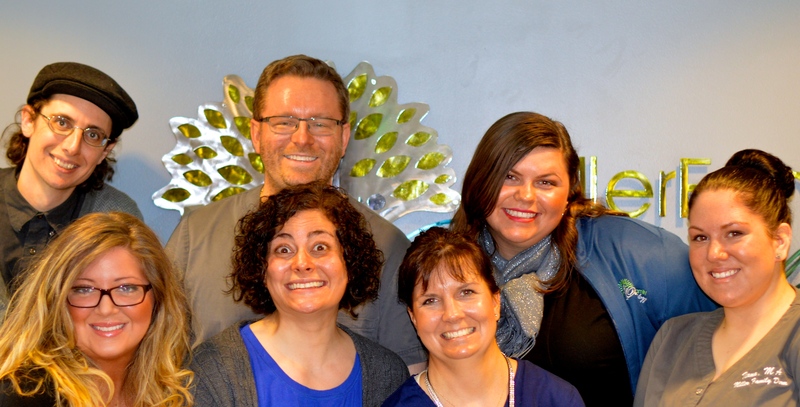 We partnered with our friend Holly Aungst, who does Airbrush Tanning in Sammamish at Glow. We asked her to make us look completely ridiculous for this post so this is not a good example of her work. (At the time of this photo, we had only had the spray tan on for an hour or two, so they’re mostly bronzer.) But if you want a truly healthy alternative to tanning, spray tanning is definitely the way to go. So, to get back to reality, we have some Facts and Myths about tanning. Ultraviolet radiation penetrates into the cells of our skin and damages the DNA in our cells. This leads to genetic mutations in the skin that the body tries to repair. At the same time, an increase in pigment production is triggered. This pigment helps to block ultraviolet radiation and it does help limit further damage. So getting a base tan sounds like a fantastic idea! You damage your skin a little bit, but after that your skin is better protected than ever! Except that it doesn’t work. This was proven in a clever study where samples of normal human skin were grafted onto mice that were then given tans. If the base tan hypothesis is true, you would predict that after getting a tan, the skin grafts would be less susceptible to burning on later sun exposures. The exact opposite was found. First, tanning will increase your natural SPF by about 4 at most. That’s pretty wimpy. If you’d normally burn in 15 minutes, your base tan might protect you for 60 minutes. Secondly, your body doesn’t repair the genetic damage that quickly, it takes it about 30 days. If you tan more during that time you are just adding more and more mutations. Lastly, your body doesn’t repair all of the genetic damage. It probably fixes 99.9% of it. But those little 0.1% bits add up over the years. And if you get enough of those 0.1% bits of damage in just the right places (genes), those cells will turn cancerous. In the United States, having a tan has become really culturally ingrained as a sign of health, but in reality, you only become tan because the DNA in your skin has been damaged. Another way to look at it is that how tan you are is a sign of how much genetic damage you have done to your skin. Blistering sunburns are a well-known melanoma risk factor. They definitely increase your skin cancer risk. Somehow, this has led to claims that tanning without burning is safe. But just like unicorns, “safe” tanning is a myth. Cumulative sun exposure, whether a burn develops or not, is also very much a risk factor for melanoma and other skin cancers. The reason, as explained above, is that each tan causes DNA damage in our skin that doesn’t get completely fixed. It accumulates over the years and eventually cancer develops. The difference between tanning and burning is that, with a sunburn, the amount of genetic damage is so overwhelming that instead of trying to repair the damage, a suicide response is triggered in the burned cells. They try to kill themselves so that they don’t become cancerous. But not all of them succeed, and the surviving cells are full of DNA damage, waiting for just a little bit more damage in just the right place to become cancerous. 3. Tanning beds are safer than the sun. The World Health Organization classifies them as carcinogen delivery devices because they are machines built to deliver ultraviolet radiation, a known human carcinogen. They are specifically made to be more convenient than spending an afternoon outside by being engineered to deliver large doses of radiation in a shorter amount of time. They create the same type of genetic damage that the sun does, but only better, more quickly, rain or shine. 4. The tanning bed industry is highly regulated to ensure safety. 90% of tanning salons denied the known risks of tanning. About half them said that it would not increase the risk of skin cancer in a fair-skinned teenager. Some said the link to skin cancer is just a rumor. 80% said that tanning improved health. Some of the claims were that it would prevent cancer, could treat depression and low self-esteem, cure arthritis, help weight loss, reduce cellulite, boost the immune system and treat lupus. None of these are true, some are clearly made up, and others are lies. Tanning salons ignore FDA recommendations. The Food and Drug Administration recommends no more than three visits in the first week, but 75% of tanning salons permit daily tanning. 5. Tanning beds are a safe way to get vitamin D.
If tanning beds weren’t carcinogen delivery devices this would be true. Here is some Vitamin D with a side dish of skin cancer. I’ll take my salmon instead (very high in Vitamin D), or a Vitamin D pill (5 cents per day). From about October to April the energy from the sun as far north in Seattle is not enough to make Vitamin D. If you spent all winter standing outside, naked, to get your Vitamin D, the bad news is that you got no Vitamin D and just looked ridiculous and cold and wet. After about 15 minutes, Vitamin D production stops and additional exposure starts leading to its destruction. Perhaps this is a way for our body to prevent the development of toxic levels of Vitamin D.
6. Dermatologists use ultraviolet light treatments, so it must be safe. The first part of this statement is true. Ultraviolet light treatment, or phototherapy, is used to treat some conditions. It is quite effective for psoriasis, for some patients with dermatitis, and even for a rare type of lymphoma in the skin. The ultraviolet lights that are most commonly used in the office use something called narrowband UVB. This wavelength of light (311 nanometers) has been found to be the single most effective wavelength for psoriasis. Our phototherapy booth could be used as a tanning bed, but it doesn’t lead to tanning as well as the other wavelengths, and will easily cause burns. If our phototherapy booth was at a tanning parlor, it would end up being the one in the corner that everyone would avoid using because it gives them a rotten tan and they keep burning themselves instead. When we treat patients with it, we have to very carefully control their dosing (the exact amount of energy is measured each time) to not burn them. Also, keep in mind that phototherapy patients usually have chronic skin diseases and tend to see dermatologists at least a couple of times every year, so if they got a skin cancer it will also be found. We now have about 30 years of data on narrowband UVB and we have not found an increase in skin cancer risk in the patients we treat with it. However, even if there was a risk, these patients usually have such bad skin that they need some form of treatment. For them, phototherapy is usually a safer (and usually cheaper) option than other types of treatment, which usually involve oral or injected medications that suppress the immune system or have significant risks of liver or bone marrow damage. It’s a very different scenario than tanning to satisfy some misguided perception of health or beauty. Contrary to the claims you may hear at your local tanning salon, tanning is not safe or beneficial to your health. It is the number one cause of life-threatening melanoma in young adults, and even for those who don’t burn it significantly increases the risk of melanoma and other skin cancers. UV light exposure, whether at the tanning salon or outdoors, is not a safe way to increase your Vitamin D. The only safe way to get a “healthy glow” is to buy it…in a bottle.